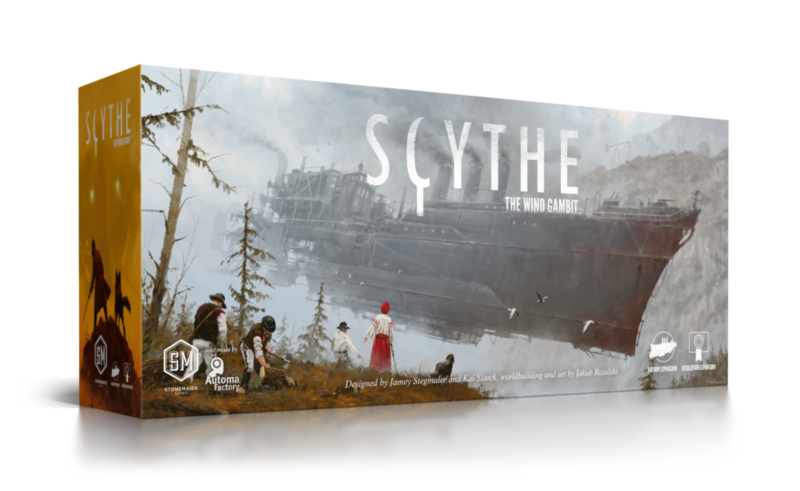 This expansion for Scythe adds 2 expansions: airships and resolutions. 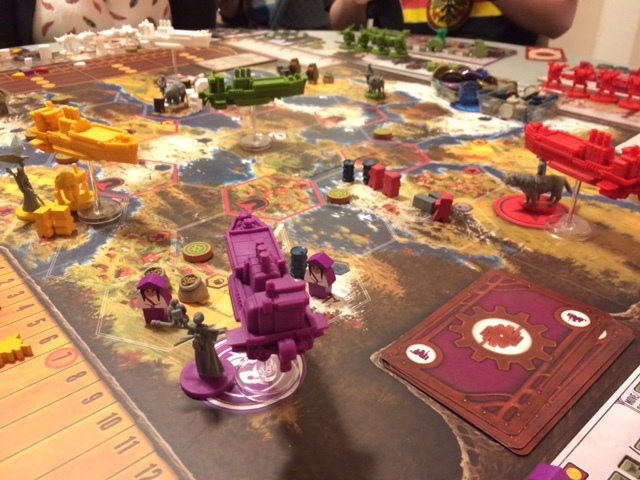 Scythe: The Wind Gambit is available from retailers worldwide. The MSRP is $25, and the SKU is STM631. Hi, I have a question, when a player move a airship he can also move another thumbnail? For example I move an airship of two hexagon, then I can move also a mech? Riccardo: At the beginning of the game, your player mat’s Move action shows 2 movement. That means you get to move 2 different units. 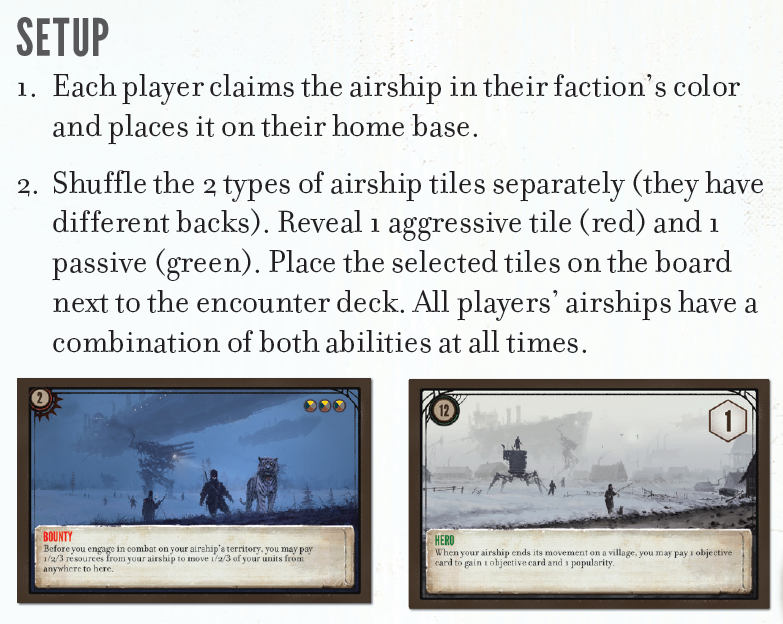 So you could apply one of those movements to your airship (each airship has a different range, but if it has a range of 3, you could move the airship up to 3 spaces), and then you could apply the other movement to one of your other units, like a mech. There was a backstory for the mechs and characters that I used for inspiration for painting them. 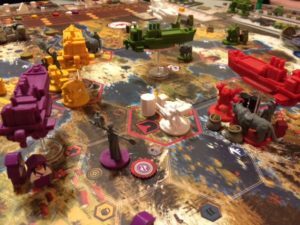 Is there any backstory to the factions airships? 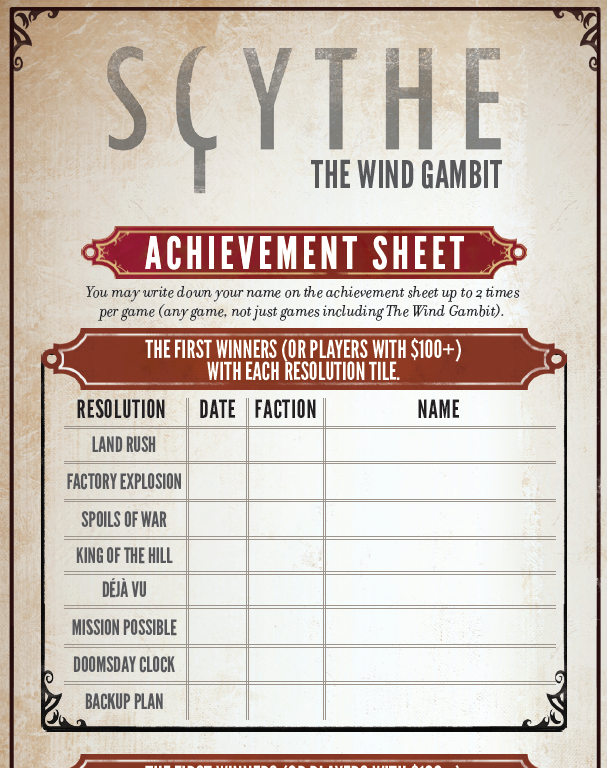 There’s an overall backstory in the Wind Gambit rulebook, but not a different backstory for each faction. 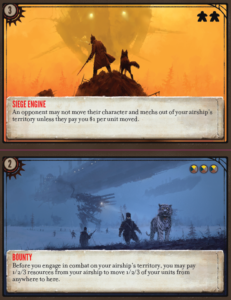 I have a question about passive card 12 in wind gambit expansion. 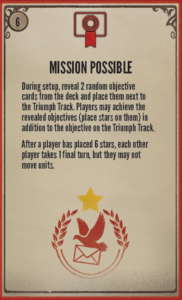 If I complete an objective card and earn a star, do I turn in my other objective cards to the deck? 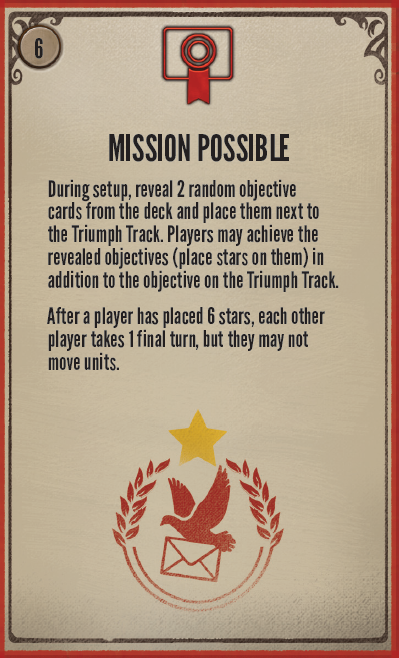 In other words, can l still use the airship’s passive ability to exchange objective cards and earn a popularity bonus? Stephen: Good question. Normal rules still apply–when you completely your first and only objective, you must discard the rest. 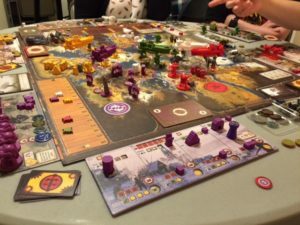 Hi, i just get my hands in this super cool game who fascinated all my group, but even being easy to grasp i have some confused ideas about some rules im sure you can help me with (For a disclaimer i will say i looked after those questions before but didnt found anything related too). Got a question about the skill tool in the airship card. Whe play the advanced variant where every ship has different skills, this means not all the ships can carry resources. 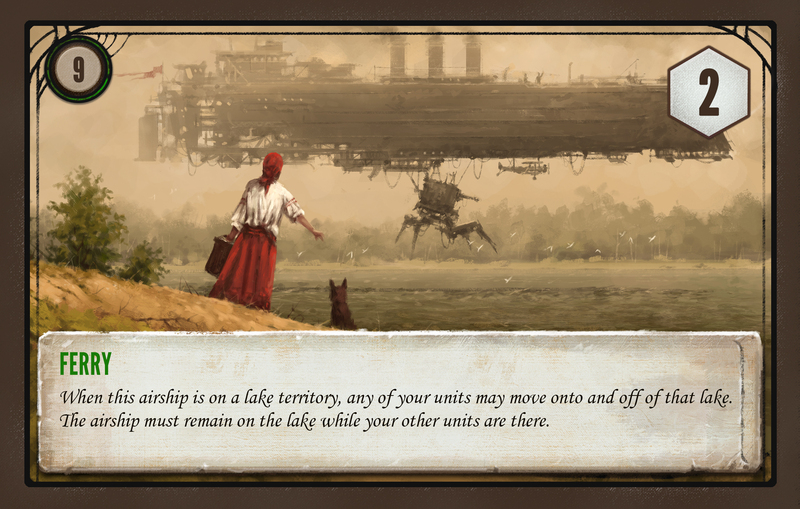 Since we have to pay one resource the unit carry to leave the space of the airship with tool this seems to be impossible for certain ships to do since they can only carry workers. So the question is ¿Does tool affect other airships or it work only for ground units). Also, in the same variant, if someone has the blitzkrieg skill, ¿Is him the only one allowed to put cards/power in the airfight? Looked reasonable to me since otherwyse the usefulness of the skill will be pretty much negated. And while whe are at that ¿Isnt the war reporters (Sorry for the translate, i have the spanish version of the game) too lame compared with other belic skills? Just win 2 or 3 coins at the cost of havinf 1 or 2 workers not producing nor doing something useful looks pretty bad in my opinion. Vladimir: Thanks for your question. 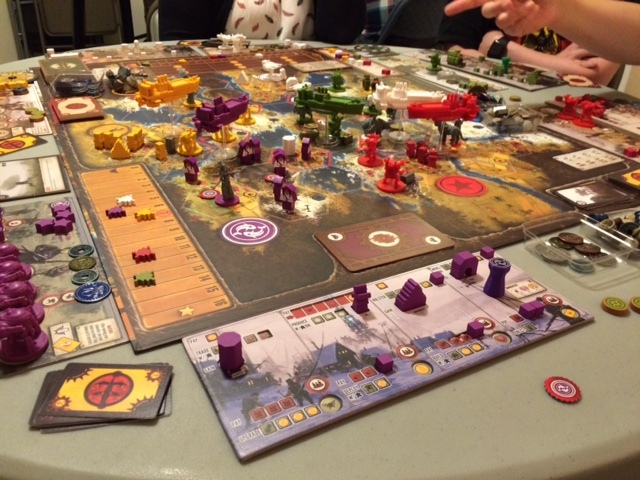 That variant is a variant because of situations like this–there are no rules that allow for these situations. I think you could house-rule Toll to apply only to ground units, not airships (as it normally does). I would say that Blitzkrieg cannot be used at all in this variant, as its ability is specifically about airship-to-airship combat. Whether or not a card is “lame” is up to you to decide. Obviously I think the ability is good enough, or I would not have designed it. 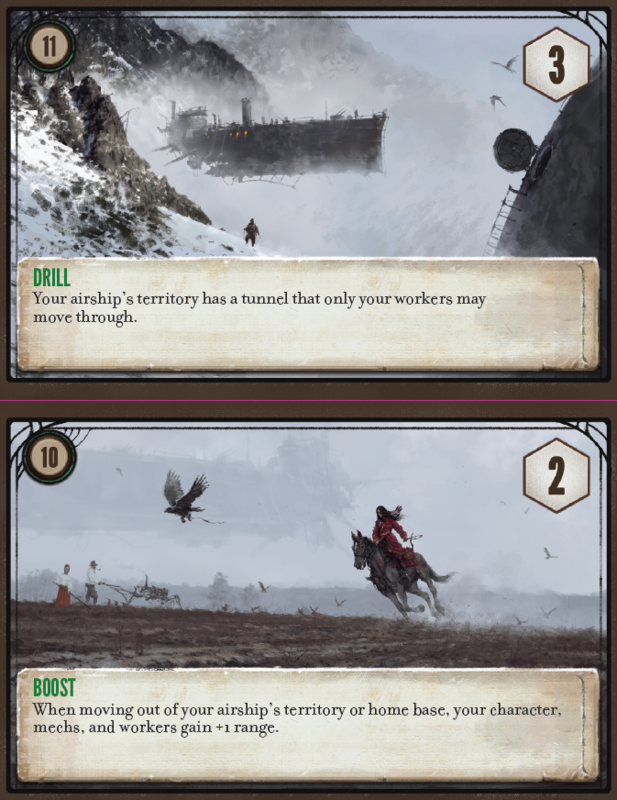 Hello Jamey, what happens to the Bounty card if I have my airship in a territory under my control, but only with workers and an opponent’s mech moves in? Do I get to use the resources on the ship to call in my mechs? 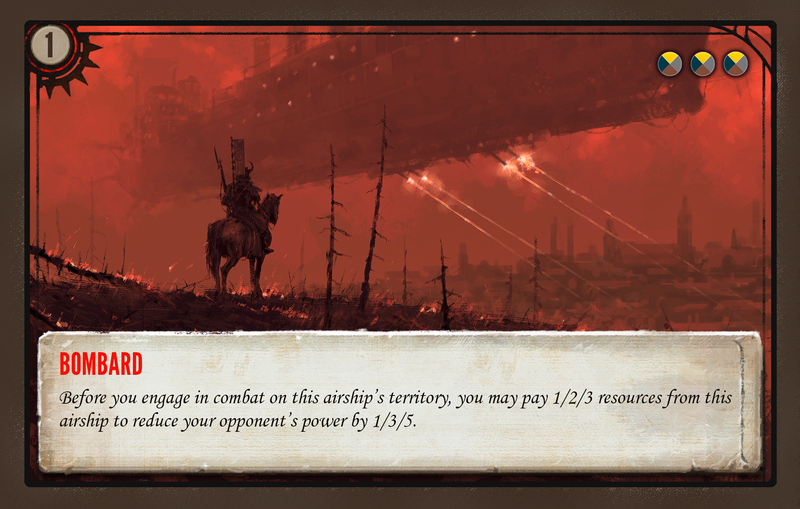 With the aggressive tile 7 of the Wind Gambit, will placing the airship in a territory with units prevent the units from leaving it without paying a toll, or can the units leave the territory freely? They can leave freely, just not enter. 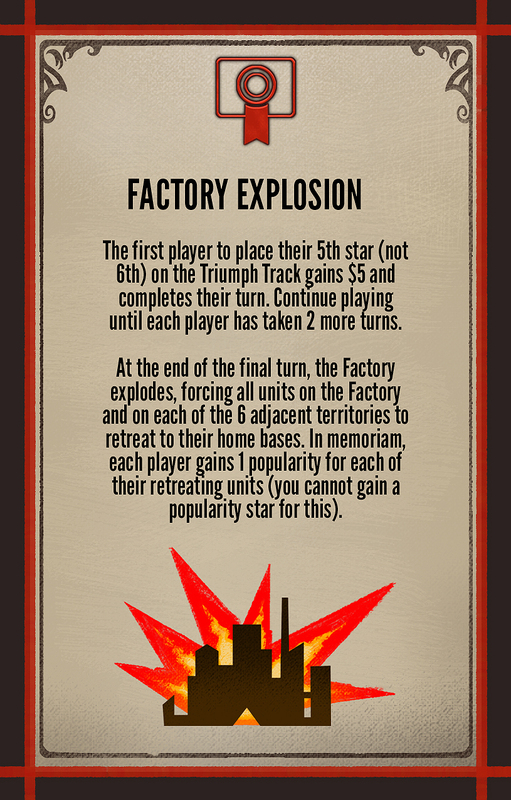 Love being able to move workers to new hexes and build on them in order to meet the Structure Bonus cards easier! 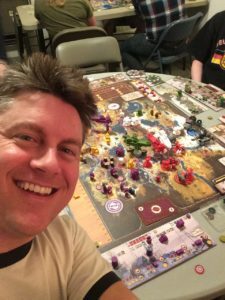 Love the expansion! Exemple: Wood available on an hex and I move my airship on the hex. Rules say I can’t use the woord since it’s not on the airship. How/when can I transfert the ressource abord the airship? 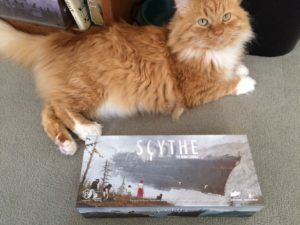 Only when I move the airship to another hex? 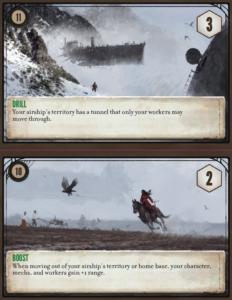 Same thing for workers : THe airship grabs them just like the mech does when it moves to another hex? 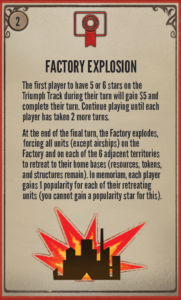 The mech drops automatically the workers on the destination hex. Same thing for the airship? 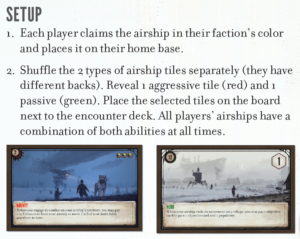 Whenever you move an airship from, to, or over a hex that either (a) you control or (b) no opponent controls, you can put the resources on the airship. So yes, same as the mech. 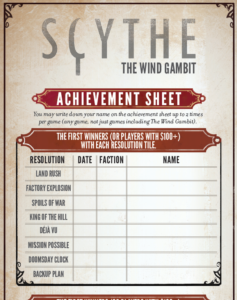 I have a question concerning the Wind Gambit extension. 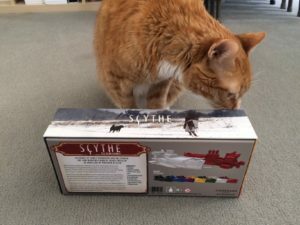 What happens with the resources uploaded to an airship which lost a combat? 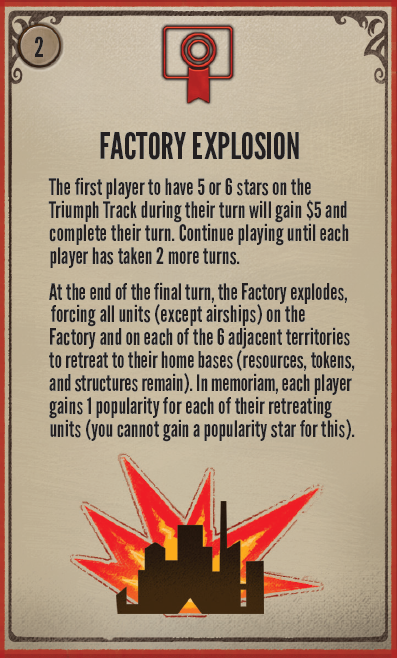 Are they dropped and remain on the territory (like during land combat)? 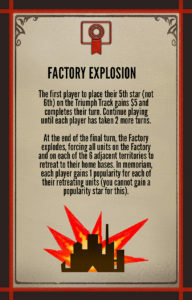 The description of the airship tile “Blitzkrieg” just refers to what happen with workers, but not to resources. The Blitzkrieg tile only shows workers in the upper right, so it cannot carry resources.